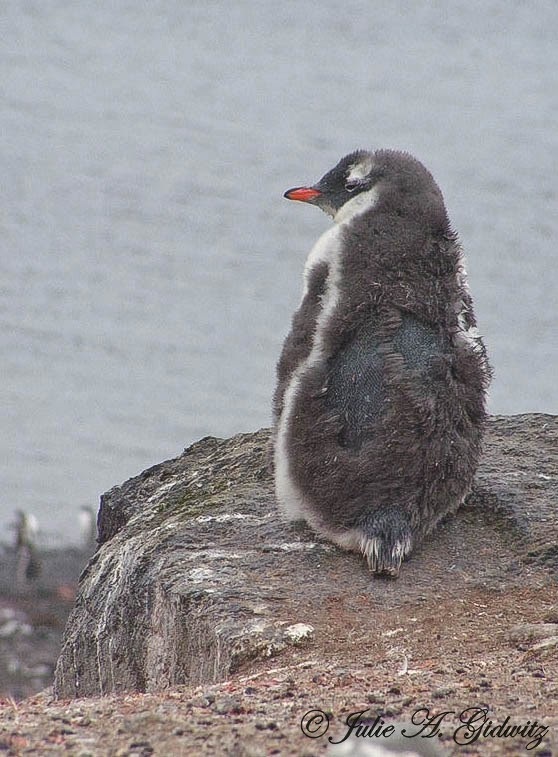 My previous post, Penguins Galore in Antarctica: Part I, covered days 1 - 5 of my marvelous 2006 adventure to Antarctica. Part II will span the remainder of the trip. We woke up the next morning to the glorious sight of the Lemaire Channel. On either side was a dramatic scenery of glaciers and snow-capped mountains. Petermann Island was the destination for our morning excursion. This jagged piece of outcropping housed thousands of penguins, most of them downy chicks. The island terrain was both icy and rocky which made for a slippery trek. The snow and ice bore a reddish tint due to a wind-borne algae that grows in Antarctica. We also spied a couple of yellow tents erected on the island. We were told that naturalists were conducting a study of the Imperial Shags that inhabit this island. Imperial Shags, also known as Blue-eyed Shags and Blue-eyed Cormorants, eat mainly fish and invertebrates. These adept divers build their nests consisting of grass and seaweed on top of cliffs, close to the ocean. Shag chicks are born without feathers. The juveniles sport predominately brown plumage. The morning excursion began with a zodiac ride to Half Moon Island. We scaled the craggy rocks to view a Chinstrap Penguin colony and some languorous Fur Seals. 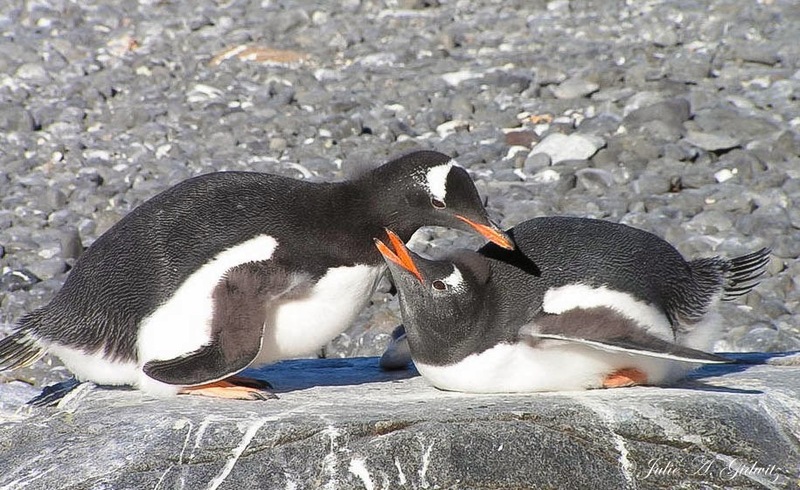 The busy penguins spend their days honking, feeding, molting, preening and waddling around the jagged terrain. We gleefully enjoyed the entertaining show displayed by these adorable comical black and white creatures. These terns are often seen hovering 30 - 40 feet above the water. Once a fish or crustacean is spotted, they rapidly plunge dive to capture the prey. They also commonly follow fishing vessels. Arctic Terns are know to have one of the longest migrations. They nest in the Arctic and winter in Antarctica, traveling an annual distance of more than 25,000 miles! In preparation for our afternoon zodiac cruise, the captain positioned the ship off of Pleneau Island. Once we were settled in our inflatable boats, we motored towards some magnificently sculpted icebergs in the distance. What a magical place with ice of all shapes, textures and shades of blue. Around every corner were new and spectacular forms. As we floated along, we took note of several large ice floes with Crabeater Seals lolling peacefully atop. We continued our way north in the Gerlache Straight as the scenery shades turned a mellow blue-gray and rose. It was truly an expedition day to remember. The sights we viewed in Antarctica, to put it mildly, were magnificent. We often felt like we were in another world, basking in all of its pristine perfection. Antarctica is a realm whose beauty is so spectacular and otherworldly that it often left us speechless. It is not just the breathtaking scenery that beckons, it is also the incredible display of wildlife: thousands of penguins and numerous other seabirds. There is also an abundance of marine mammals in the region, including most of the world's great whales and a multitude of seal species. Our journey through the "last continent" was an unforgettable once in a lifetime experience that we will never forget. Cool trip, Julie! I love the penguins and the whale. Awesome photos and post..
Wow! I am so jealous but I'll happily view your photos! I don't like to be cold, but I might brave it for shots like these! Awesome! This brings back happy memories for me of 2 great trips to the area. It certainly is a magic place for all the reasons you give. A Birder's Guide to Everything. See it now! Do Mute Swans Migrate in North America?